Here are the Wholesale Price Index numbers for the last five years. 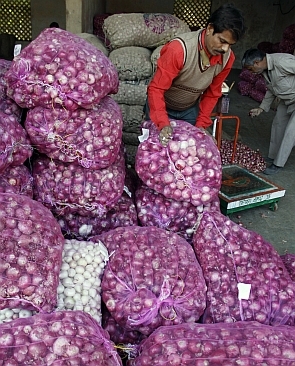 India's annual rate of inflation, based on its monthly Wholesale Price Index, climbed to 6.01 per cent for the month of May 2014, as against 5.20 per cent for the previous month and 4.58 per cent during the corresponding month of the previous year, setting off alarm bells among the ruling establishment as well the common man. The official WPI for 'all commodities' for the month of May rose by 0.8 percent to 181.7, from 180.2 in the previous month. Meanwhile, onion prices and their sharp fluctuations have dominated the nation-wide discussion about price rise and cost of living, with explanations ranging from 'governance deficit' to supply constraints and speculative hoarding on fears of a weak monsoon. 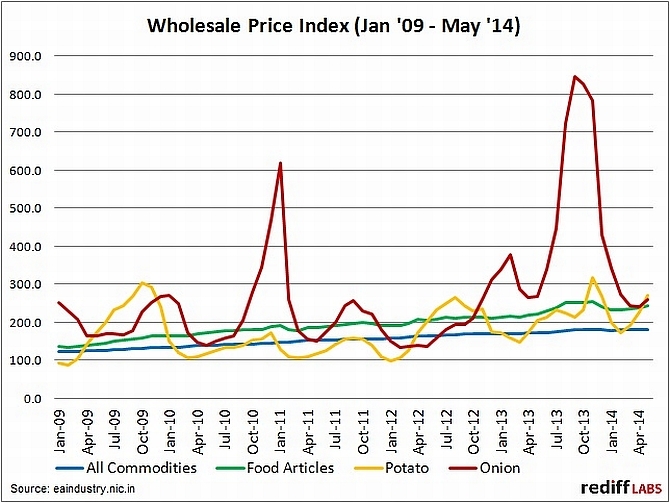 Rediff.com's data journalists bring you the official WPI figures for all commodities and food articles along with the onion and potato Wholesale Price Indices from January 2009 to May 2014 published by the office of the economic adviser to the ministry of commerce and industry. We found it curious that while the onion and potato indices are parallel at most times, sharp surges in the former are not extended to the latter.